Since the foundation of the Royal Group in1951, we have pursued high quality and genuine hospitality through food. Recently, the Japan economy and society, as well as the food industry, have undergone profound transitions. Royal Group continues to dedicate ourselves to contributing to the development of Japanese food culture, no matter how much the social environment changes. With the advancement of globalization, visitors from all over the world enjoy and praise the Japanese food culture and “Omotenashi” ? a spirit of hospitality, helping us to realize once again that this is part of Japanese culture that we can be rightly proud of. “Omotenashi”, being practicing widely in the hospitality business, will possibly play an important role in sustaining Japan’s economy. 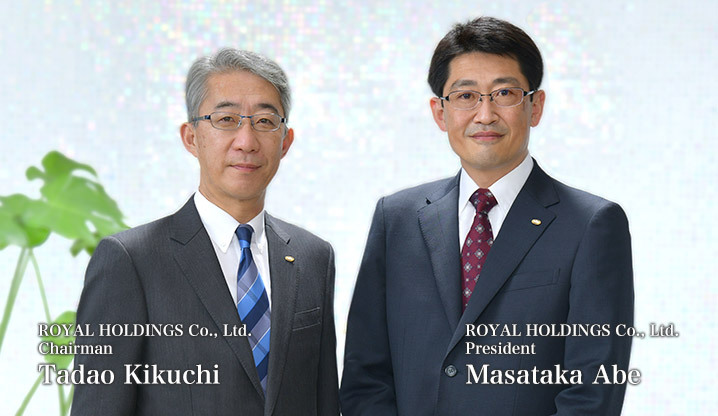 The Royal Group is engaged in a wide range of businesses from operating restaurant chains and specialty restaurants such as “Royal Host”, “TENDON TENYA” and etc. ; and airport and highway restaurants to in-flight catering services, providing contract food services to large facilities like hospitals, and managing hotels. We continue to make the utmost effort to build a sustainable business model by providing Japan’s highest quality hospitality to customers in all business areas of the Group. Royal is in business of providing food services. a fair profit and continued prosperity.